Unfortunately, your registration has been declined by the auctioneer. You can contact the auctioneer on +44 (0) 1442 832234 for more information. You are the current highest bidder! To be sure to win, come back on 14 Nov 2018 10:21 GMT Date Format as the lot closes or increase your max bid. Wyles Hardy & Co Ltd do not undertake packaging, postage, delivery or shipment of goods and the bidder must make his own arrangements to comply with the clearance terms. Credit Card and Debit Card details are used for registration purposes. Wyles Hardy & Co. Limited DO NOT accept payment by Credit Card but do accept Debit Cards. 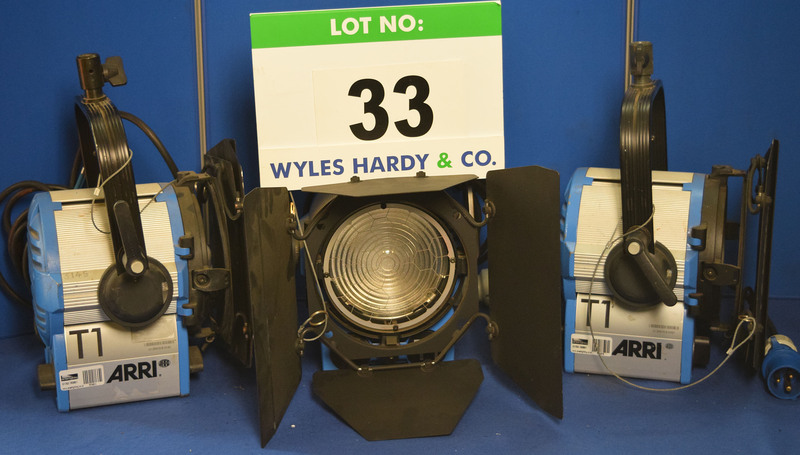 Sales by Timed On-Line Auction on Behalf of The Administrators of On Set Lighting Limited. Viewing: The lots for sale may be viewed on 12th and 13th November 2018 between 10.00am and 4.00pm at Wyles Hardy & Co Ltd., Ley Hill Road, Bovingdon, Hemel Hempstead, Hertfordshire, HP3 0NW. Car Parking: There is limited parking at the premises. Damage: Person’s attending the viewing will be held liable for any damage they cause, and shall meet all costs and expenses incurred in the rectification of the damage so caused, as advised by Wyles Hardy & Co Ltd.
Bidding Process: Bidding will end at 10.00am UK Time on 14th November 2018 [subject to staggered timings and the normal 10 min extension] at which time all highest bids will be considered. Acceptance of Final Bids: IMPORTANT NOTE – Acceptance of all final bids is subject to prior approval by our client. Wyles Hardy & Co Ltd reserve the right to reject any bids which they feel are insufficient. Successful bidders will be notified by email by the close of play on the 15th November 2018. Invoicing: Please ensure that the details given are the same as those to which the invoice will be addressed (under no circumstances will invoices be altered once issued). Instructions for Bidding: Access for bidding can be obtained through our website www.wyleshardy.com or www.bidspotter.co.uk Full bidder’s details including a valid email address must be provided in order to bid. You must be over 18 to use this service. In the event of a bid being received within 10 minutes of the scheduled closing time, the bidding period on that lot will automatically extend by a further 10 minutes and for a further 10 minutes for any bid received thereafter. When bidding do not forget to `Refresh` your screen to ensure you are aware of current bids. Odometer Readings and Descriptions: The company offers details of each lot in good faith and it is recommended that the purchaser satisfies themselves with the vehicles details prior to bidding. Buyers Premium: In addition to the sum bid the purchaser will pay a buyer’s premium of 15% on the hammer price plus VAT. The premium is not negotiable and will be charged to all purchasers. VAT will not be refunded on the buyers premium under any circumstances, including overseas purchasers. details of their shipping agents and their UK representatives. Value Added Tax (VAT): All lots are sold exclusive of V.A.T. which will be added to the purchasers sale accounts at the rate of 20% except those lots which are zero rated for VAT purposes as indicated in the catalogue. Non E.C. Purchasers: Purchasers must advise the intention to export their purchases on offer acceptance. VAT will be levied on all purchasers at the rate of 20%. Upon receipt of a copy of the Bill of Lading detailing the purchases, a full description of the goods purchased/exported (a simple description of “box/crate” is deemed insufficient) and confirming their export outside the E.C., the VAT will be refunded. VAT will not be refunded on the buyers premium under any circumstances, nor where the Bill of Lading is not received within 30 days of the date of invoice. If outside the 30 day timescale purchasers will need to liaise direct with HMRC. E.C. Purchasers: Purchasers must advise the intention for goods to be subject to an interstate transfer within the E.C. and also ensure that their local VAT registration details are provided when they first register for the sale. Upon receipt of documentary evidence giving conclusive proof that the interstate transfer has taken place the VAT will be refunded. VAT will not be refunded on the buyer’s premium under any circumstances, nor where the documentary evidence of the interstate transfer taking place is not received within 30 days of the date of invoice. If outside the 30 day timescale purchasers will need to liaise direct with HMRC. N.B. Purchasers are solely responsible for obtaining export licences, where required. Conditions of Sale: All lots will be sold, subject to the Terms and Conditions of sale, as shown on our website and those contained within this schedule. Bidders are strongly advised to read them carefully and to re-visit the same from time to time to acquaint themselves with any amendments/additions. Payment Terms: All purchases are to be paid in full, no later than 4.30pm UK Time on Thursday 22nd November 2018. Debit Cards: We accept the following debit cards, Switch, Delta, Electron and Connect – we do not accept Credit Card payments. Please note that, to protect both the purchaser and our client from any fraudulent activities, Debit Card transactions will only be accepted at our Bovingdon office with the card holder present, in person and with a second form of ID. Cash: Limited to £500 maximum transaction value, payments above this sum will not be accepted in cash. Bankers Draft: Please note Wyles Hardy & Co. NO LONGER accept Bankers Drafts as payment for purchases. All queries regarding payment should be directed to our enquiries@wyleshardy.com, quoting AD1056. What work is going to be carried out ? How is the work going to be carried out ? Who is going to do the work and their competences to do that work ? When is the work going to be carried out ? If any independent contracts (including hauliers) are to be used, who are they and confirmation of their competence(s) will be required. If any machinery or lifting equipment is to be utilised, certificates of safety and or conformity must be provided. If any “hot working” is to be carried out, this must be specified together with details of the safety measure that will be put in place. Copies of public and employee liability insurance certificates must be provided. Method statements must be provided, at least 2 working days prior to the work being scheduled to commence. Method statements must be approved by Wyles Hardy & Co Ltd prior to the work commencing; submission does not gain automatic approval. Insurance of Lots: The bidder / buyer is at risk once the buyer is notified of his successful purchases and is strongly advised to effect insurance at once, irrespective of whether title has passed. Title does not pass to the purchaser until payment has been received in full. Buyers of motor vehicles and/or road-going powered plant are responsible for ensuring that prior to use on the road, that in all respects the vehicle complied with all legal requirements as to the construction and the use of such a vehicle and further more for obtaining all certificates, permits and other authorisations necessary. Clearance of Purchases: All lots must be removed by appointment between 10.00am and 4.00pm from 19th November to 23rd November 2018 from Wyles Hardy & Co. Ltd., Ley Hill Road, Bovingdon, Hemel Hempstead, Hertfordshire, HP3 0NW the buyers expense. The premises will be open from 10.00am to 4.00pm. Wyles Hardy & Co Ltd do not undertake packaging, postage, delivery or shipment of goods and the bidder must make his own arrangements to comply with the clearance terms. Clearance of all lots must be undertaken in accordance with Health & Safety at Work Regulations and, where necessary, Construction Design and Management Regulations 1994. The purchaser should ensure that their contractors hold sufficient public liability insurance, copies of which should be made available to Wyles Hardy & Co Ltd if demanded. Transfer of Lots: Wyles Hardy & Co Ltd will only accept payment from and permit removal of lots purchased by the successful purchaser or their duly appointed agent. Wyles Hardy & Co Ltd reserve the right to refuse to accept the bid of any bidder should they be unable to satisfy Wyles Hardy & Co Ltd on any of the above. If you agree to the Terms and Conditions and this specific Notice to Purchasers you may register for this event. Registering for this event means you agree to both the BidSpotter.co.uk website’s Terms and Conditions and also Wyles Hardy & Co Ltd’s Terms and Conditions for this Sale. Provision of Services Information: Wyles Hardy & Co. Ltd’s (whose trading style is Wyles Hardy & Co) principal place of business is Ley Hill Road, Bovingdon, Hemel Hempstead, Hertfordshire, HP3 0NW, Great Britain. Registered in England No. 2598566, Registered Office: 9 Bonhill Street, London EC2A 4DJ, Great Britain. VAT Registration Number: GB579 1851 94. Please note Wyles Hardy & Co Ltd issue self billing invoices only. Wyles Hardy & Co. Ltd operate a complaints handling procedure which is in compliance with the requirements of the RICS. Professional indemnity insurance is provided by Markel (UK) Limited, Verity House, 6 Canal Wharf, Leeds, LS11 5AS. These are the conditions applying to all sales by timed online auction ("Auctions") managed by Wyles, Hardy & Co Limited (registered in England under number 2598566 and registered at Epworth House, 25 City Road, London, EC1Y 1AR) ("Wyles Hardy & Co Ltd"). Online Sales utilise licensed software and remote servers operated by bidspotter.co.uk and we refer you to their terms and conditions detailed on www.bidspotter.co.uk. The goods offered for sale ("Goods") in lots ("Lots") at Auctions are owned by the person selling them ("Vendor(s)"), for whom Wyles Hardy & Co Ltd is only an agent. Wyles Hardy & Co Ltd does not sell on its own account and the buyer of the relevant Lot ("Buyer") buys the Goods from the relevant Vendor(s) ("the Contract"). The Vendor(s) may sell to the Buyer subject to additional terms. Wyles Hardy & Co Ltd facilitates the purchase through the Auction. These Conditions of Sale by Auction contain some terms between the Buyer and Wyles Hardy & Co Ltd in respect of the Auction and some terms that include the Vendor(s) too. These Conditions of Sale by Auction incorporate the online auction Terms & Conditions (if applicable) and the relevant Schedule and Notices to Purchasers document ("Schedule") in respect of a particular Auction. To the extent there is any inconsistency between the documents, the order of precedence is this document, then the online auction Terms & Conditions, then the Schedule. All documents are subject to addition or variation by notices posted on www.wyleshardy.com. Parties attend the Premises or such other place from where the Goods are stored ("Site") at their own risk and neither the Vendor(s) nor Wyles Hardy & Co Ltd will be individually or collectively liable for any loss or damage, death or personal injury, howsoever occasioned, to any party or property which may be present on the Site, for whatsoever purpose, except that nothing shall exclude either the Vendor(s)`s nor Wyles Hardy & Co Ltd`s liability for death or personal injury caused by its respective negligence. 1.Wyles Hardy & Co Ltd acts as agents only, on behalf of the Vendor(s)s.
2.Where the Vendor(s) is a company in receivership or liquidation or administration, the receiver or liquidator or administrator will not have any personal liability whatsoever under the Contract, except for death or personal injury caused by his negligence. a.All statements contained in the catalogue or referred to in the catalogue relating to the Goods ("the Catalogue") are made without responsibility on the part of the Vendor(s) or Wyles Hardy & Co Ltd. All statements contained in the Catalogue or referred to in the Catalogue in respect of authenticity, origin, date, age, period, condition, attribution, quantity, measurement or weight of the Goods are statements of opinion and are not to be taken as implying statements or representations of fact. b.Wyles Hardy & Co Ltd makes no warranty or representation as to the anticipated or likely selling price of any Lot or item or of its value. Any written or oral estimate given by Wyles Hardy & Co Ltd or its employees or agents as to the estimated selling price of a Lot is a statement of opinion only, and may not be relied on as an indication of the actual selling price or value. c.All illustrations, photographs, pictures or images contained in the Catalogue or elsewhere regarding the Lot are for identification purposes only. They may not be an accurate reproduction of the Lot. d.The Goods are sold as they lie with all faults, imperfections and defects. The Buyer shall be deemed to have inspected and approved the Goods. The Buyer buys at his own risk and with notice of all faults, imperfections and defects. The Goods are sold by the Vendor(s) as seen and inspected by the Buyer. e.No warranty is given by the Vendor(s) or Wyles Hardy & Co Ltd that the Goods comply with the Health and Safety at Work Act 1974, any statutory amendment or re-enactment thereof, any regulations made thereunder or any other applicable health and safety law. Consequently, Buyers undertake to carry out any necessary work in order to ensure that each Lot conforms with the law before the Lot is put into use. f.No Lots are supplied as new as regards the Consumer Protection Act 1987 or any other product liability law. g.Wyles Hardy & Co Ltd and the Vendor(s) do not represent Goods sold by Auction as being in a condition which makes them suitable for domestic use. Despite the above, should Buyers intend to supply any Goods for domestic use, they should ensure that the Goods comply with the requirements of the Furniture and Furnishings (Fire Safety) Regulations 1988 or any other similar law. h.Certain types of plant and machinery and ancillary equipment can contain hazardous materials, chemicals, etc. Buyers must ensure that the removal of such hazardous materials, chemicals, etc. from the Site is carried out in accordance with the Health and Safety at Work Act 1974 and Control of Substances Hazardous to Health Regulations 1988 (COSHH) and any other relevant Act of Parliament, Regulations or relevant Legislation covering such substances. a.Subject to the rest of the Conditions of Sale by Auction, the highest bidder shall be the Buyer, subject to the Approval by the Auctioneers and/or the Vendor(s). The sale price is exclusive of the buyers premium and VAT. b.The conduct of the sale shall be at the Auctioneers` discretion, the Auctioneers may impose any condition on bidding and it is their right to refuse any bid. c.If a dispute of whatsoever nature arises, the decision of the Auctioneers will be final and binding on all parties. d.No bid may be withdrawn after the completion of the bidding process. e.The Vendor(s) and the Auctioneers reserve the right to fix reserves on any Lot and to bid either themselves or by their agents and to alter, vary or withdraw any Lot prior to or during the sale. f.The Vendor(s) and the Auctioneers reserve the right to advance the bidding as they decide. a.Payment in full must be made by telegraphic (CHAPS) or electronic bank transfer or such other means as Wyles Hardy & Co Ltd accepts in its discretion, in accordance with the Notice to Purchasers and prior to the clearance of any Lots purchased. b.All offers are deemed to be made exclusive of VAT and the Buyer must pay VAT in addition, where appropriate, at the prevailing rate. c.Full payment is not deemed to be made until payment has been received by Wyles Hardy & Co Ltd`s banker’s clearance. The Buyer shall pay a 15% premium on the purchase price of each lot sold (such premium used to defer the costs of sale) together with the value added tax at the current rate (20%) on the purchase price of each lot and on the premium. a.Legal and equitable title to the Goods will not pass to the Buyer until the later of the price for the Goods having been paid in full (together with any applicable costs of transport and storage following the sale) and the Buyer having removed the Goods from the Site. b.All Goods sold shall be the sole responsibility and at the risk of the Buyer from the acceptance of the bid, even if the Vendor(s) or Wyles Hardy & Co Ltd move the Goods on or from the Premises. In no circumstances will Wyles Hardy & Co Ltd, the Auctioneers or the Vendor(s)s be held responsible if any Lot or part thereof is lost, stolen, damaged or destroyed after the acceptance of the bid. Buyers are therefore advised to effect immediate and adequate insurance cover. c.Wyles Hardy & Co Ltd is acting as agent for the Vendor(s) and does not own the Goods itself, nor does Wyles Hardy & Co Ltd warrant the Vendor(s)`s title to any Goods sold. The Vendor(s) transfers the Goods with such title as it has. a.Removal of the Goods from the Site shall be the responsibility of the Buyer, who shall remove the Goods on or before the date specified in the Notices to Purchasers having made prior arrangements so to do with Wyles Hardy & Co Ltd.
b.The Buyer will be responsible for obtaining at its own expense all necessary labour and plant for the removal of the Goods. Where the Vendor(s) or Wyles Hardy & Co Ltd give assistance to the Buyer in connection with such removal, such assistance is given entirely at the Buyer`s risk. c.The Buyer will indemnify and keep indemnified the Vendor(s) and Wyles Hardy & Co Ltd against all liability, loss, damage, injury or death howsoever and by whomsoever caused to the Site or anything or person therein or thereupon arising from or in the course of the removal of the Goods. d.The buyer has no right to anything which is not detailed or described in the auction catalogue. e.In accordance with the Health and Safety at Work Regulations the buyer may be required to provide a method statement and/or risk assessment for approval by the Vendor(s) and Vendor(s)s agent prior to the removal of any lots. Please refer to the Specific Notices to Purchasers. a.Any sums paid by the Buyer towards the purchase price will be forfeited to the Vendor(s). b.The Vendor(s) will be entitled to resell the Goods publicly or privately but the Vendor(s) shall not be liable to account to the Buyer in the event of a resale at a higher price than the price contracted to be paid by the Buyer. c.The Buyer will be liable for all liabilities, losses, damages, costs and expenses whatsoever suffered by the Vendor(s) or Wyles Hardy & Co Ltd as a result of the failure to remove the Goods by the required date or arising from the resale of the Goods provided that any sums forfeited to the Vendor(s) under the foregoing provisions will be credited against such liability, loss, damage, cost or expense but further that if such liability, loss, damage, cost or expense is less than the sums forfeited the Vendor(s) shall be under no obligation to make any refund to the Buyer for any such items. d.If the Vendor(s) or Wyles Hardy & Co Ltd reasonably consider damage is likely to occur in removing the Goods from the Site, the Buyer may be required to deposit such sum of money by way of security for the costs of reinstating the Site as the Vendor(s) or Wyles Hardy & Co Ltd in their absolute discretion may think fit. If the Buyer refuses to deposit such money the Vendor(s) may refuse the Buyer access to the Site for the purpose of removing the Goods and the Buyer will be deemed to be in default. a.Neither the Vendor(s) nor Wyles Hardy & Co Ltd shall be liable to the Buyer for any delay in or failure to perform its obligations as a result of any cause beyond its reasonable control. b.Where the Buyer is more than one person the duties and obligations of the Buyer will be joint and several. c.The Buyer will not be entitled to set off any sum due to the Vendor(s) under the Contract against any sums due from or liability of the Vendor(s) to the Buyer in respect of dealings between the Vendor(s) and the Buyer prior to the date of the Contract. d.The parties intend that Wyles Hardy & Co Ltd and the relevant Buyer, together with the Auctioneers, Vendor(s), receiver, administrator and liquidator may enforce their rights under these Conditions of Sale by Auction, pursuant to the Contracts (Rights of Third Parties) Act 1999.
e.These Conditions of Sale and the Contract shall be subject to and construed in accordance with English law and the parties hereto submit themselves to the jurisdiction of the English Court.